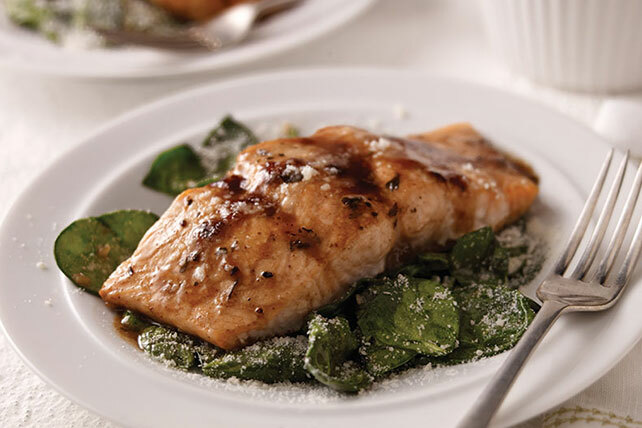 Make Mediterranean Salmon for Two tonight in just 25 minutes. Five ingredients are all you need for our tasty Mediterranean Salmon for Two recipe. Place fish in shallow baking dish; drizzle with 3 Tbsp. dressing. Bake 10 to 12 min. or until fish flakes easily with fork. Meanwhile, heat remaining dressing in large skillet on medium heat. Add garlic; cook and stir 1 min. Stir in spinach; cover. Cook 2 min. ; uncover. Cook 30 sec. or just until spinach is wilted, turning frequently with tongs. Place spinach on 2 serving plates; sprinkle evenly with 2 tsp. cheese. Top with fish and dressing from baking dish. Sprinkle with remaining cheese. Garnish each serving with 2 tsp. chopped fresh parsley or basil.